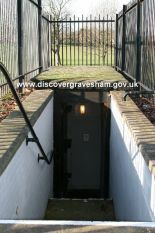 Gravesend’s Cold War bunker is located within Woodlands park and was originally known as Civil Defence Region 6. The bunker was an underground command post, built in 1954, from which Gravesend’s rescue and emergency services were to be co-ordinated in the event of a nuclear attack. Its 13 rooms contained power and ventilation plant, communications areas for the command staff and various dormitories.